The State is a machine in the hands of the governing class for suppressing the resistance of its class antagonists. In this way the dictatorship of the proletariat differs in no way essentially from the dictatorship of any other class. Over at Sinocism, Bill Bishop has published the full text of an address John Garnaut gave to the Asian Strategy and Economics forum back in 2017. Garnaut titled his address “Engineers of the Soul: Ideology in Xi Jinping's China.” The speech is an important distillation of many of the same themes that I have been writing about recently, especially on twitter. At the time of Stalin’s death, in March 1953, The Short Course on the History of the Bolsheviks had become the third-most printed book in human history. After Stalin’s death - when Stalin was eulogised as “the Great Genius” on the front page of the People’s Daily - the Chinese printers redoubled their efforts. It became the closest thing in China to a religious text…. The practical utility of the book is that it prescribes an antidote to the calcification and putrefaction that inevitably corrodes and degrades every dictatorship. The most original insight in Stalin’s Short Course on the History of the Bolsheviks is that the path to socialist utopia will always be obstructed by enemies who want to restore bourgeois capitalism from inside the party. These internal enemies grow more desperate and more dangerous as they grow increasingly imperilled - and as they collaborate with the spies and agents of Western liberalism. You can imagine how this formulation was revelatory to a ruthless Chinese leader like Mao who had mastered the “You Die, I Live” world into which he had been born - a world in which you choose to either kill or be killed - and who was obsessed with how to prevent the decay which had destroyed every imperial dynasty before. Crucially, Mao split with Kruschev because Kruschev split with Stalin and everything he stood for. The Sino-Soviet split was ideological - it was Mao’s claim to ideological leadership over the communist world. 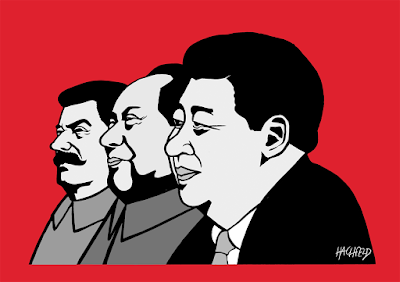 Marx, Lenin, Stalin, Mao. It was Mao’s claim to being Stalin’s true successor. We hear a lot about how Xi and his peers blame Gorbachev for the collapse of the Soviet state but actually their grievances go much further back. They blame Kruschev. They blame Kruschev for breaking with Stalin. And they vow that they will never do to Mao what Kruschev did to Stalin. At first glance, equating Xi Jinping with Stalin seems absurd: Stalin, like Mao, is on the short list for “most terrible mass murderers in human history.” Xi has no compunctions about state sanctioned murder, but his victims are in the thousands (or perhaps if we include desperate suicides of corrupt officials, tens of thousands), not tens of millions. Stalin and Mao believed in the collectivization of all things. Economic policy under Xi, though more centralized and state directed than in the Dengist era, isn't comparable to Mao's economic program. Xi Jinping does not threaten another great famine. Stalin and Mao were chaos machines: their reign was marked by constant, unending upheaval. This upheaval stretched from the highest echelons of power down to the smallest of villages. The watchword of the Xi’s new era, in contrast, is “stability maintenance” (weiwen). The modern Party is an enemy to chaos. Yet a focus on what makes Xi and his Party different from the Party of Mao and Stalin’s day obscures as much as it reveals. Xi Jinping and his cohort are heirs to the Communist tradition. The structure of the Party itself, the manner in which decisions are made, the way threats to the regime are assessed, and the tools the Party uses to subvert and overcome these threats share a distinct and undeniable symmetry with the methods and structures of the Party at its dawn. Direct lines can be drawn from the Party Mao made his own in the 1940s and the Party Xi made his own seven decades later. One of the most important legacies of the Maoist era are the techniques Mao developed to deal with individuals and groups that threatened to derail The Cause. These techniques had clear antecedents in the Soviet experience, but for the Chinese they came together in the forge of Yenan. The first of these techniques usually went under the label “united front.” United front work was what you did with organizations, movements, and groups who might threaten the Cause, but who the Party could not yet afford to openly challenge. United front work was a mix of infiltration, subversion, propaganda, bribery, and false promises. Mao’s pledges of “New Democracy” and the Party’s successful propaganda and “diplomatic matters” (waijiao shiwu) campaigns with American observers in the 1940s are some of the most prominent examples from that time. Key to this work is a candied eye for what Party leaders would today call “win-win” propositions. Both sides win, then win, then win some more—until the Party is in position to impose a decisive win-lose on the other group in question. To understand these two different types of contradictions correctly, we must first be clear on what is meant by "the people" and what is meant by "the enemy". The concept of "the people" varies in content in different countries and in different periods of history in a given country. Take our own country for example. During the War of Resistance Against Japan, all those classes, strata and social groups opposing Japanese aggression came within the category of the people, while the Japanese imperialists, their Chinese collaborators and the pro-Japanese elements were all enemies of the people. During the War of Liberation, the U.S. imperialists and their running dogs -- the bureaucrat-capitalists, the landlords and the Kuomintang reactionaries who represented these two classes -- were the enemies of the people, while the other classes, strata and social groups, which opposed them, all came within the category of the people. At the present stage, the period of building socialism, the classes, strata and social groups which favour, support and work for the cause of socialist construction all come within the category of the people, while the social forces and groups which resist the socialist revolution and are hostile to or sabotage socialist construction are all enemies of the people. Thus a particular group could at one point be an honored part of “the people,” at another point an ally in a “united front,” and later a despised “enemy” of the regime. How the regime treated you depended very much on how threatening Party leaders believed you might be to the regime and its cause. Today The Cause has flipped—officially—from socialist revolution to national rejuvenation. The Party works under the same schema but has shifted the “people” that Mao identified with specific economic classes to the nation at large. Mass mobilization campaigns have been retired. But struggle and united front campaigns have not. Xi’s great corruption purge, the Uyghur labor camps of Xinjiang, the attack on Christians across China—these all follow the same methods for crushing and coercing “enemies” developed by Mao and the Party in the early ‘40s. “One Country, Two Systems,” interference campaigns in the Chinese diaspora, the guided, gilded tours given to Musk and his ilk—these all follow the same methods for corrupting and controlling “allies” developed by Mao and the Party that same decade. The tools have never changed. The only thing that has changed is the Party’s assessment of who is an "enemy" and who is part of the "people." There is one threat, however, that the Communist legacy has poorly prepared the Party to face. Stalin and Mao conceived of their projects in cultural terms—they were not just attempting to stamp out dangerous people, but dangerous ideas. To that end both Stalin and Mao cut their countries off from the world they had no control over. If your end goal is socialist revolution this might be tenable. But if your end goal is national rejuvenation—that is, a future where China sits at the top of a global order, more wealthy and powerful than any other—then engagement with the outside world must be had. It means foreigners coming to China in great numbers, and Chinese going abroad in numbers no smaller. It means a much more accurate conception of the way the rest of the world works among the minds of the Chinese people. It means contemplating paths for China that do not involve being ruled by a dictatorial party-state. But what can they do about it? In essence, they have two main options. The first is retreat and retrenchment. If enough walls can be thrown between China and the world, then the cultural threat posed by the West may be managed. We already see this, to an extent. We shall likely see more of it. While I doubt we will see the sort of economic retrenchment that marked Stalin’s reign, I would not be surprised if we see a more limited quest for autarky, the type that led Japan on its own path to totalitarian rule. The Western conspiracy to infiltrate, subvert and overthrow the People’s Party is not contingent on what any particular Western country thinks or does. It is an equation, a mathematical identity: the CCP exists and therefore it is under attack. No amount of accommodation and reassurance can ever be enough - it can only ever be a tactic, a ruse. With this I agree entirely. The implications of realization are wide-reaching. I encourage you to explore them. That is it for today. Tomorrow or the day after I will have a follow up post where I outline a few of the points where I disagree with Garnaut's take on the 21st century Communist Party of China. John Garnat, "Engineers of the Soul: Ideology in Xi Jinping's China," speech given at the Asian Strategy and Economic Forum, 21 August 2017, posted at Sinocism on 16 January 2019. On waishi work see Anne-Marie Brady, Making the Foreign Serve China: Managing Foreigners in the People's Republic (Washington DC: Rowan and Littlefield Publishers, 2000), ch. I-III. On the bureaucracy of the United Front, see the introduction of Brady, “Magic Weapons: China's political influence activities under Xi Jinping,” Wilson Center report, 18 September 2017. Garnaut, "Engineers of the Soul." A very readable history of all this: Frank Dikotter, The Tragedy of Liberation, 1945-1957 (New York: Bloomsbury, 2014). Mao Zedong, "On the Correct handling of Contradictions Among the People," a highly edited version of a speech originally given in the 11th Session of the Supreme State Conference in February 1957. This version was published in the People's Daily on June 19, 1957. Timothy Heath, "China's New Governing Party Paradigm: Political Renewal and the Pursuit of National Rejuvenation," address for the USC UC-China Institute, 29 January 2015. For a summary of many statements, see Matthew Johnson, “Securitizing Culture in Post-Deng China: An Evolving National Strategic Paradigm, 1994-2014,” Propaganda in the World and Local Conflicts 4, iss. 1 (2017), 62-80. The issue is also treated well in Samantha Hoffman, "Programming China: the Communist Party’s autonomic approach to managing state security," PhD diss, University of Nottingham (2017), ch II. On Stalin's retrenchment and possible comparisons with Xi, Andrew Batson has an interesting post: "Xi vs. Stalin: What Drives the Reversal of Economic Reforms," Andrew Batson's Blog, 7 January 2019. On Japan see Michael Barhart, Japan Prepares for Total War: The Search for Economic Security, 1919-1941 (Ithica: Cornell University Press, 19. The methods are similar to those used by Western advocates of political correctness. It would be interesting to know the historical connections. I have read your blog for years, the quality has held up well. We have not yet seen an Asian country that is wealthy, democratic and not an ally of the US. Japan, Korea, Taiwan and Singapore all seem to be client states of the US. What if the adoption of western values by non western nations leads to a loss of self confidence and assertiveness? What is the problem with China wanting to develop its own form of modernity as it grows economically, much like the west did post industrial revolution? Is it possible that China can hit upon a different path that fits its culture better than western values? "Is it possible that China can hit upon a different path that fits its culture better than western values?" If the Party were content to let China develop its own political system in isolation, nothing. The trouble is that the way they conceive of threats to this system compels them to undermine the workings of other nations and the institutional safeguards the democratic nations have built into international society. The Chinese can of course say something of the reverse (it is they who set out to change us) and they would not be wrong to do so. But movements for that sort of thing will happen regardless of the government's policy. The two systems are thus hard to reconcile. To put things another way: in order to make Party truly feel secure, America would have to dismantle the protections for liberties at home that make the liberal system distinctive in the first place. This is "the problem." "Japan, Korea, Taiwan and Singapore all seem to be client states of the US. What if the adoption of western values by non western nations leads to a loss of self confidence and assertiveness? " I don't think the Japanese or Koreans could be said to lack confidence and assertiveness about their culture. On the other hand, being much smaller countries they can't be autarchic and isolationist like China is. If anything, it is the Chinese who often seem to have a constant feeling of cultural insecurity which they try and hide with constant chest-thumping and displays of pride. "What is the problem with China wanting to develop its own form of modernity as it grows economically, much like the west did post industrial revolution? Is it possible that China can hit upon a different path that fits its culture better than western values?" I think these sorts of arguments would have more traction if China wasn't literally going backwards in terms of its openness and its tolerance for dissent. If China's form of modernity is one where contact with the outside world is kept to a minimum and everyone has to think the same, then it's not a very appealing form. It fits the culture better? Then change the culture. The Soviet leader's name was "Khrushchev"
It was interesting to me that Mr. Garnault included the following sentence in his speech: "At the risk of being politically insensitive, it is totalitarian." He found it necessary to make a slight genuflection to the unseen agents of political correctness when describing Lenin, Stalin and Mao's communism. It will be hard to contest the CCP when even somebody who sees them as clearly as Mr. Garnault does, has to sort of apologize for not being blind.